KANSAS CITY, Kan. — A family's grief has lingered now for four years. That's how long it's been since 36-year-old Chad Donaldson was murdered Dec. 22, 2014, while walking along a street in Belton, Missouri. 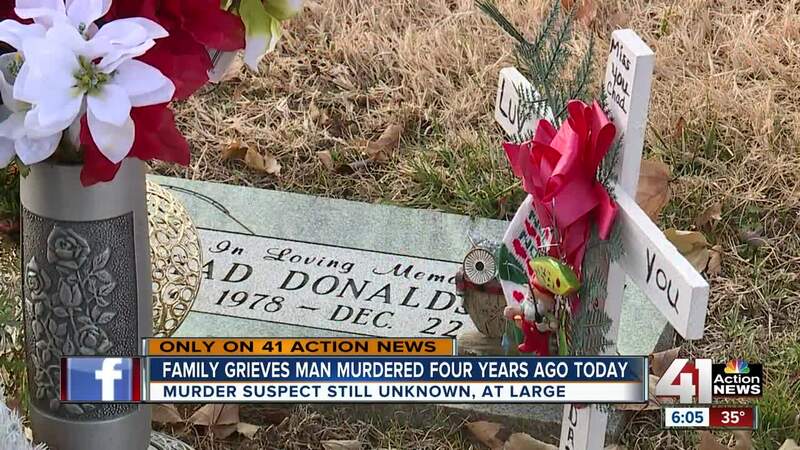 Police don't have any leads and Donaldson's murder is considered a cold case, but the family gathered Saturday to mark the anniversary of his passing and refuses to give up hope. "I still relive it," Chad's mother, Jenny Donaldson, said. "I try not to. I try to be positive and think about all the good that's happened." It's a difficult task without closure surrounding his death. The last four years of wondering who killed her son have been tough for Jenny. "That's another layer of difficulty on top of everything else," she said. To commemorate Chad, his family and friends gathered a few days before Christmas, hoping this is the last holiday they will have to spend not knowing who murdered him. "That's very frustrating, more than a little," Chad's cousin, Carly Seiffert, said. "It's not fair (and) needs to be figured out." A small Christmas tree was decorated with more than a dozen ornaments, each symbolizing the person Chad was. "A snowman kind of represents how much he liked to be outside no matter what the weather was," Seiffert said. "He was an outdoorsman." Jenny added, "A lot of people brought in fishing ornaments, because he was a fisherman. That was his big thing, but he also loved nature and hunting mushrooms and reptiles and he was just an outdoor guy." According to the family, KC CrimeStoppers plans to put up a billboard soon to help get the word out. Anyone with information is urged to call the TIPS Hotline at 816-474-TIPS (8477).